What’s On Your Learning Agenda? A learning agenda is a strategic approach for building an evidence base to inform decision making. A new brief explains what a learning agenda is, how to develop one, and how to integrate it with programmatic and research and evaluation activities. 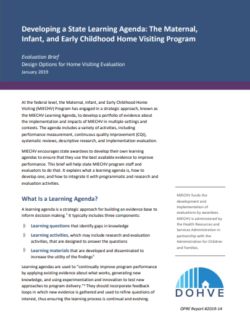 The brief, Developing a State Learning Agenda: The Maternal, Infant, and Early Childhood Home Visiting Program, was designed to help state MIECHV program staff and evaluators develop learning agendas to ensure that they use the best available evidence to improve performance. At the federal level, MIECHV has engaged in a learning agenda to develop a portfolio of evidence about the implementation and impacts of MIECHV in multiple settings and contexts. JBA developed the brief as part of the Design Options for Home Visiting Evaluation (DOHVE) project, funded by the Office of Planning, Research and Evaluation, Administration for Children and Families. DOHVE builds the capacity of MIECHV awardees to expand the evidence base on home visiting, strengthen programs, and share knowledge.